· Social needs: It is the third hierarchy of needs which comes after fulfilling safety or security needs. Man is social in nature. Therefore, human beings always want to live in society or group which loves him/her the most. These needs include love, affection, friendship, social acceptance etc. So a manager can initiate participation of the employees as part of association to motivate the people. · Esteem/ego needs: After fulfilling the social needs of people, they now want esteem needs by which they can have some special and unique place or status for him/her. They want to be prestigious and respected which is known as esteem or ego need. It is the second last need of Maslow’s need hierarchy theory. This need includes self confident, self respect, prestige, power, status, job title etc. So s/he wants to be strong and want to have immense power from which s/he can get self satisfaction. A manager can provide the attractive job position to employees to fulfill esteem or ego needs. 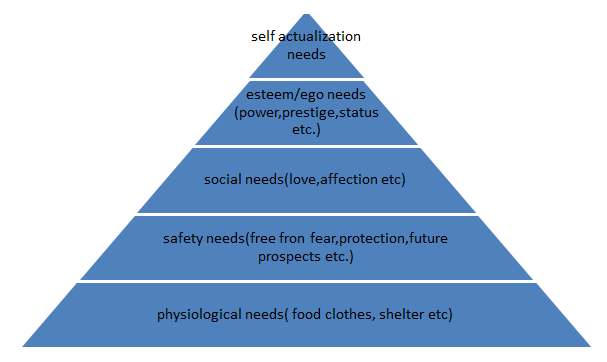 · Self-actualization needs: Maslow said that self actualization is the last and highest need in his hierarchy. After all needs are fulfilled especially including esteem/ego needs they now want or desire to help others. It is maximization of one’s potential. In this need people want to be satisfied in their desire. It includes challenging jobs, creativity, risk bearing capacity etc.